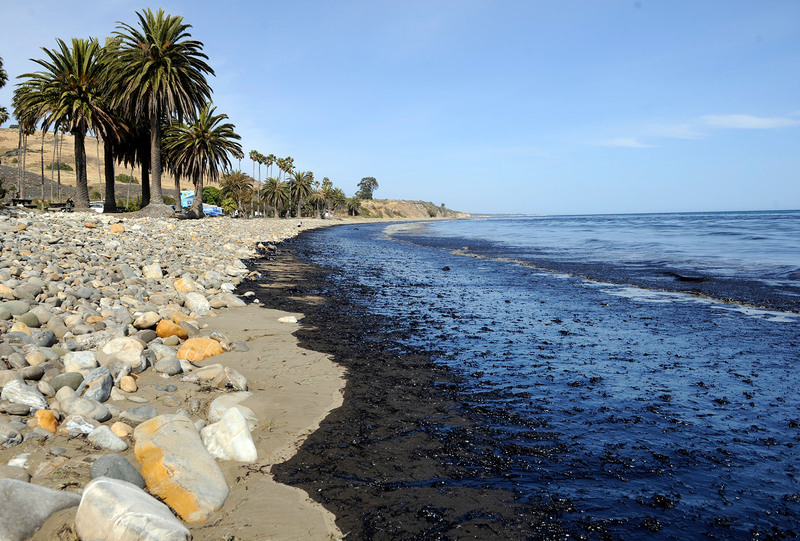 Spilled oil laps onto Refugio Beach. The criminal trial against Plains All American Pipeline ​— ​the Texas-based company whose pipeline ruptured in 2015, allowing 142,000 gallons of oil to spill into the ocean near Gaviota ​— ​began this Thursday in the courtroom of Judge James Herman. Opening arguments remain weeks away, and attorneys for both sides have many pretrial motions to hammer out first. Plains is facing joint prosecution from Kevin Weichbrod with the Santa Barbara County District Attorney’s Office and Brett Morris with the California Attorney General. Initially, these two agencies had filed criminal charges against the pipeline company based on a 46-count criminal indictment handed down by the Santa Barbara Grand Jury on the first anniversary of the spill in May 2016. Of those counts, four were felonies, the rest misdemeanors. Since then, the case has slimmed down considerably. Today, Plains is facing 15 criminal counts, three of which are felonies, the rest misdemeanors. 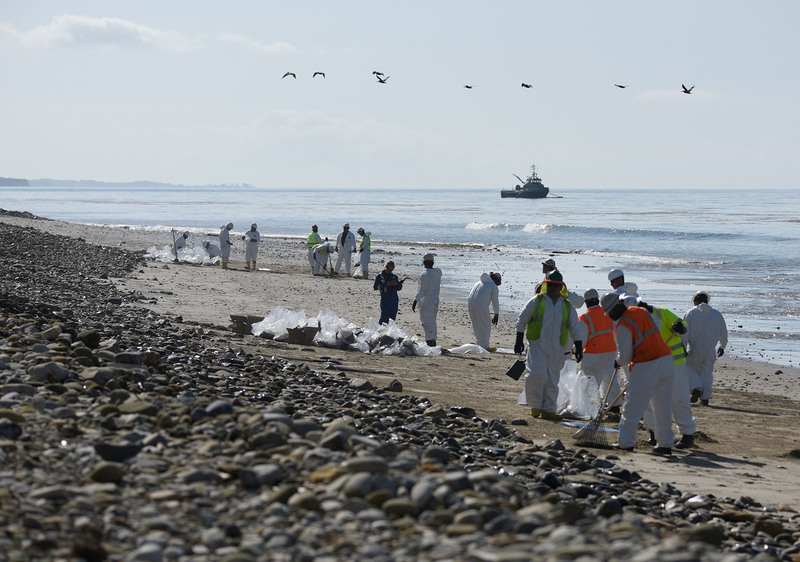 Key to the criminal case against Plains is the assertion that the company knew or should have known that a stretch of its pipeline running along the Gaviota Coast ​— ​known as Line 901 ​— ​was so dramatically corroded that it posed an imminent threat of spillage. That the oil got into federal waters constitutes another felony. The bulk of the misdemeanor charges involve marine mammals and sea birds either killed or injured during the spill and subsequent cleanup. Company attorneys declined to comment, but in the past, Plains has issued press releases taking vehement issue with the filing of any criminal charges. Whatever lapses the company is responsible for, it asserted, did not rise to the level of criminal conduct. The Plains prosecution marks the first time the Santa Barbara District Attorney’s Office has ever filed criminal charges in connection with an environmental offense. Given the defendant in this case is a corporate entity ​— ​not an individual ​— ​the likely penalty if Plains were to be found guilty would be a fine. The criminal case, however, is only a fraction of the pipeline company’s legal woes. Two class action lawsuits are currently looming against Plains, the first one tentatively set for trial early next spring. That involves three classes of plaintiffs asserting damages from the spill. The first group includes individuals from the fishing industry. The second involves oil industry employees effectively put out of work because the pipeline ruptured, or others employed by companies with oil industry contracts. Attorney Barry Cappello, one of the chief litigators in this action, estimates there are about 500 in this group. Yet to be certified as part of the class action lawsuit are several thousand beachfront property owners ​— ​or those with easements ​— ​affected by the spill. Cappello estimated this group could be as many as 10,000. 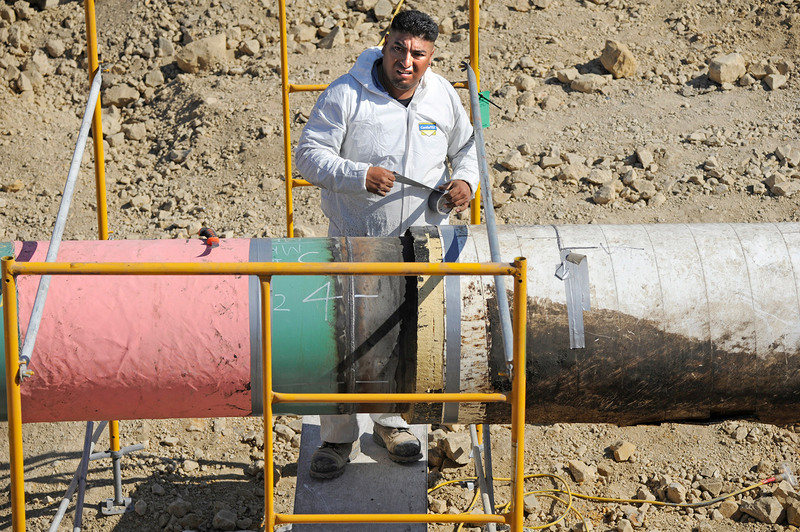 In the meantime, Plains has proposed either replacing or repairing 130 miles of pipeline that run from Ellwood to Gaviota to Sisquoc and finally to Kern County. The most recent plans have been submitted to the County of Santa Barbara for review and approval. Without a pipeline, oil companies ExxonMobil and Freeport-McMoRan can’t get their oil from off the coast in marine reserves to storage and processing facilities along the coast. Cappello is also involved in a separate class action lawsuit against Plains for the property owners along this route who had granted easements to allow the pipeline to be built on their land and operated. Cappello stated that Plains had initially balked at equipping the new pipeline with automatic shutoff valves, but he said the company acquiesced in the face of this litigation. All other pipeline operators in the county have used automatic shutoff valves to minimize oil spill damage in event of ruptures. Making the Plains pipeline unique was the absence of such valves. Plains’ predecessor company ​— ​All American ​— ​refused to install such technology when the pipeline was first installed in 1990, arguing the County of Santa Barbara lacked legal authority to impose such requirements.